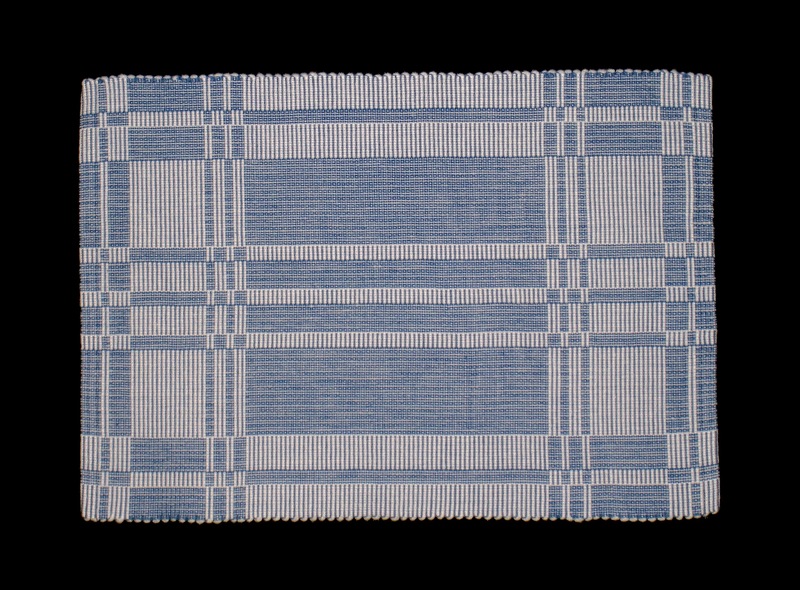 A friend of mine asked me to make her some placemats (to replace some plain weave acrylic ones I had made when I first started weaving – oh, my). I had seen this structure in a Weaver’s Craft magazine (Issue 19) and was eager to try it to redeem myself from my previous not-rep-weave project. 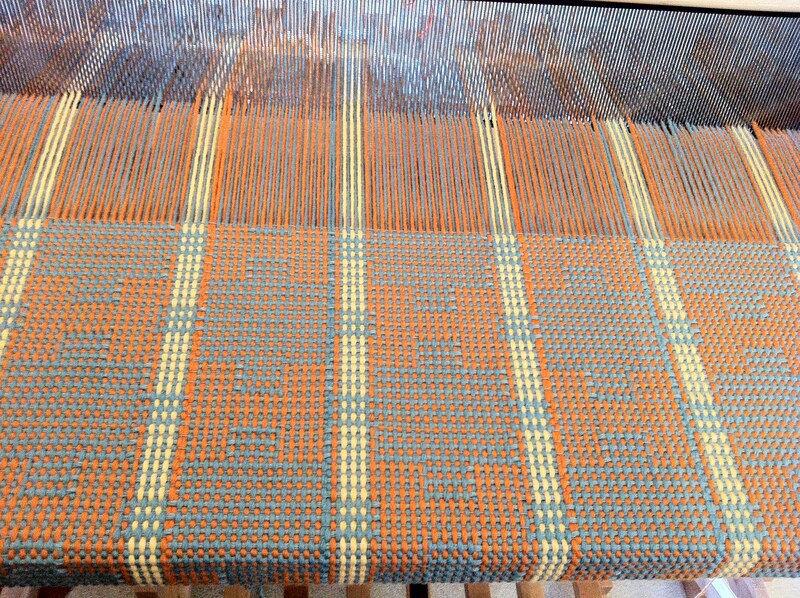 The warp threads are intended to be farther apart than in most rep weave to let the thick weft show through. 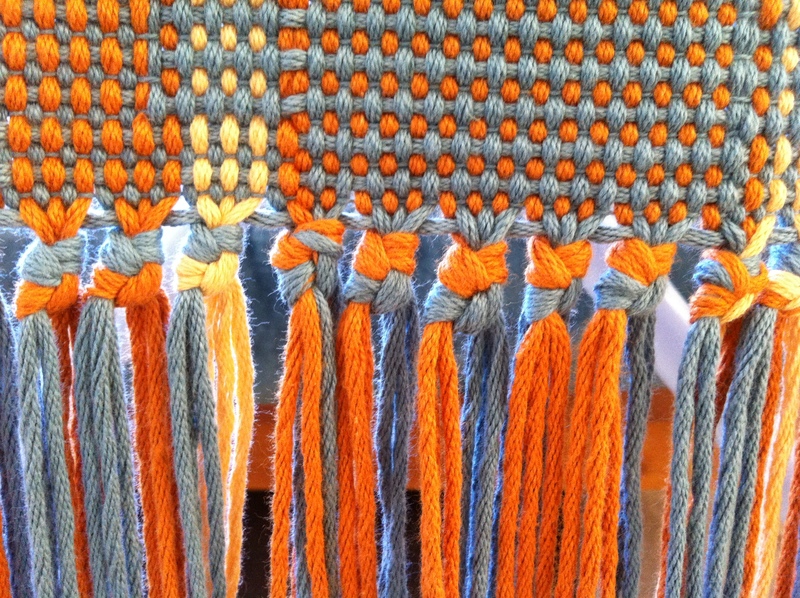 I did this with 8/2 cotton for the thin yarn (warp at 30 epi, and thin weft), and 16/8 (mop) cotton for the thick weft. It was quite easy and quick. Fortunately, I had warped enough for 5 placemats, as once I had it all off the loom, there was a strange treading error at the beginning of the first one. So, that one is my sample, and the 4 go to my friend. 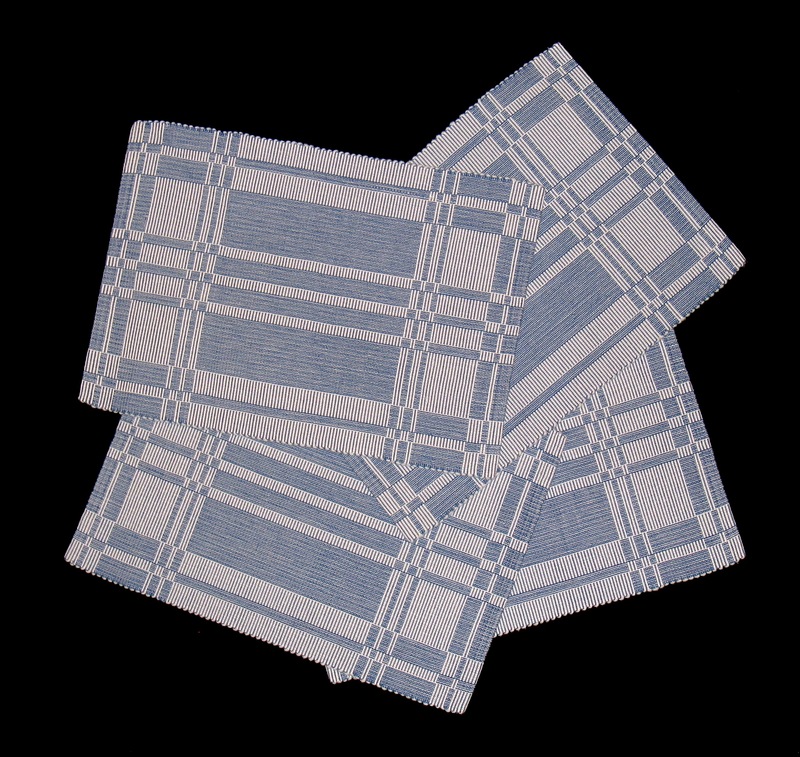 The hemming was pretty easy – there is an inch of plain weave at each end as part of the design, and it just gets folded under twice, and then machine stitched over a thin weft (stitch in the ditch). I machine washed them in cold water, and hand flattened them before machine drying. A steam iron did the rest. Nice! I”ll do more rep weave! A friend asked me to weave a wall hanging for her with a Southwest theme. What I know best is twill, so I found a diamond pattern and she liked it, but then I was concerned the floats wouldn’t be long enough for the pattern to be visible across a room. 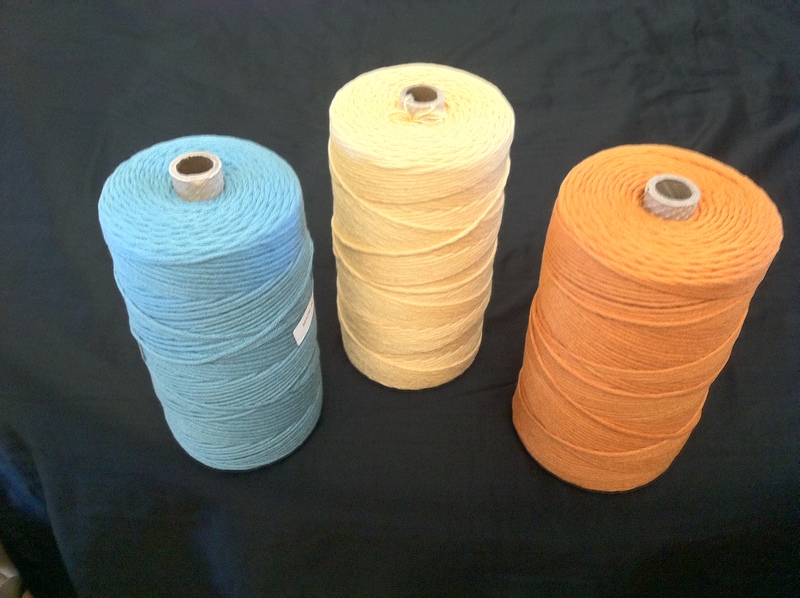 My (new weaver) solution was thick yarn, and I ordered cotton mop (16/8) yarn in the appropriate colors. While waiting for the yarn, I became concerned that twill wouldn’t work at all – wouldn’t the floats tend to sag over time from hanging vertically? I realized what I really need to do was rep weave, but I’d never done it, and all the drafts I could find were of stripes, not diamonds. How to make the twill work? My solution would be to alternate the cotton mop in both warp and weft with 8/2 cotton in plain weave to give it structure. Sort of a weird summer and winter. I had it off the warping board and ready for the loom when I took a little break and looked again for rep weave with a diamond pattern, and I found it!! 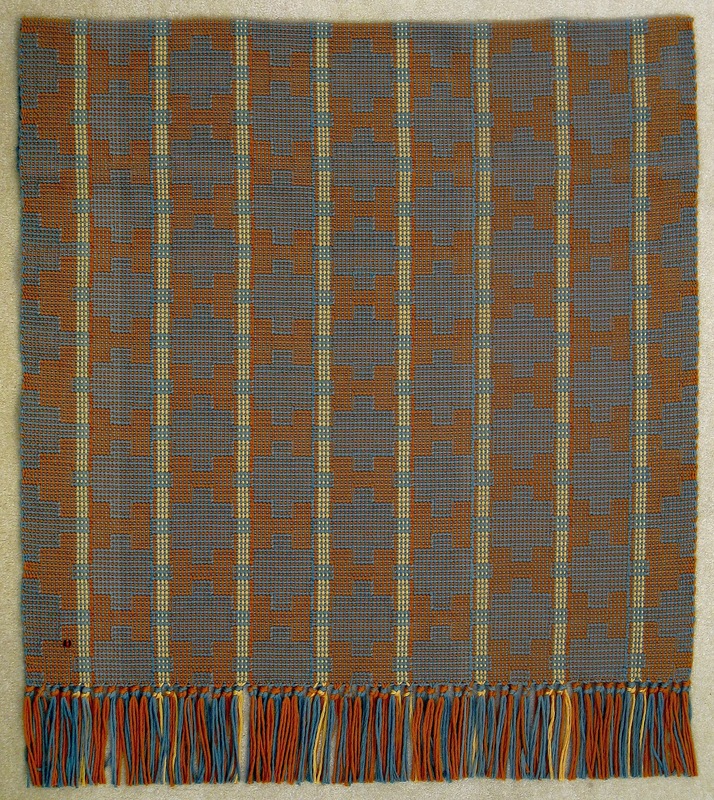 It was in a lovely blog that said the structure was found in Handwoven Sept-Oct 1988. Oh my. Interweave to the rescue! I was able to find and download the issue, and I had the draft in front of me in minutes. I transferred the structure to iWeaveit in the appropriate colors, sent a quick screenshot to the recipient, who liked it, and I had my rep weave diamond structure! A short (or not) matter of winding the warped yarn back on to the cones, and I was ready to start over. Warping with mop cotton. 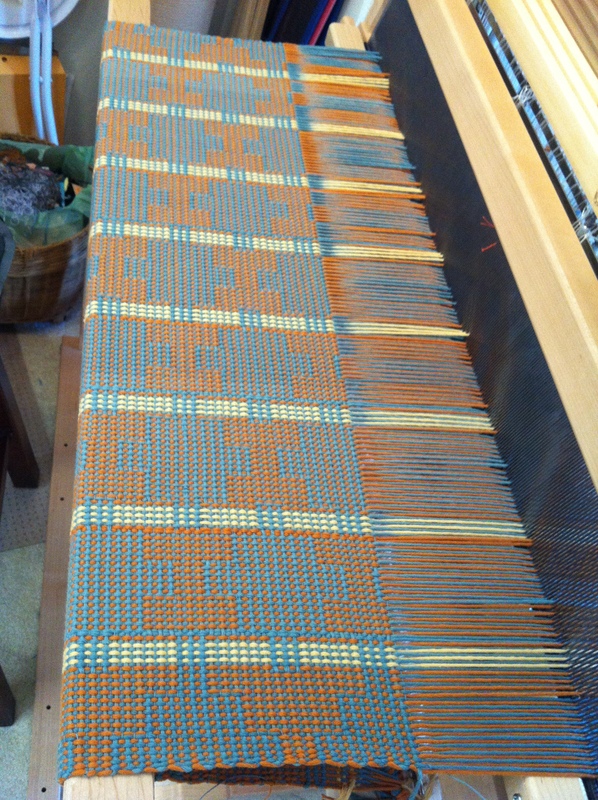 It seemed like it would work – just double the sett for plain weave, and triple the warp to use for the thick weft, right? Oh my, again. After two picks I knew I didn’t have rep weave. More resources – I actually emailed Madelyn van der Hoogt to ask if I should just start over, and she responded quite humorously (within a couple of hours!) that in order for rep weave to work with a warp of mop cotton, I’d need to use PCV pipe for the weft. Worse than I expected!!! Starting over would be a drag, though, and here was all this yarn on my loom. So, I decided to weave it up anyway (alternating thick and thin in the weft), and see what happened. Not rep weave, but not bad! 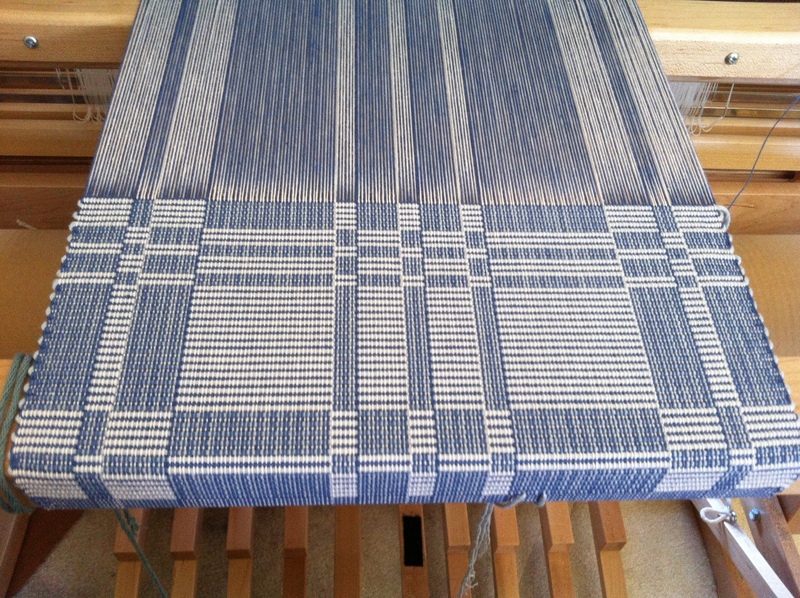 There are a few odd bits like vertical lines where the same blue warp is doubled for the change in pattern/background, but I asked my recipient to come over while it was still on the loom, and she thought it would be fine. Fortunately, I had a large enough sample area at the end that I was able to try out a couple of different ways to attach the folded-over loop at the top (I ended up zig-zagging the edge, and stitching the seam “in the ditch” so it’s barely visible from the front), and to figure out a knot that I liked for the fringe (overhand was too bulky). This is a photo of it just flat on the floor, but the recipient now has it hung up, and loves it, and will invite me over to take a photo soon. I’ll put that up in the gallery. Not rep weave, but it’s a unique and interesting piece. And she likes it! Good enough!